You want to be in my gang? Rockstar has just dropped the first gameplay trailer for Read Dead Redemption 2, giving fans a chance to see the highly-anticipated title in action. 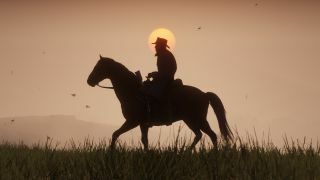 The six-minute trailer is the first part of Rockstar’s gameplay demo and showcases a deeper and living open world, set at the pivotal moment in history when the age of outlaws was ending and industry was beginning to thrive. As Arthur Morgan, a senior shooter in the notorious Van Der Linde gang, your comrades are your family. As the gang is forced out of each area, you set up a new camp where gang members eat, sleep, perform chores, and play games. Over time you get to know your camp-mates better, building friendships, and gathering food and supplies to keep camp morale high. The camp will act as your base, from which you can set off to explore a variety of terrains including mountains paths, forests, swamps, and bustling cities populated with a variety of animals and interesting characters. However, unlike the sequel, you can interact with these citizens in a much deeper way. You can call out to fellow riders as you pass, talk your way out of trouble with the sheriff. And even intimidate witnesses into keeping their mouths shut. Whether you escalate or diffuse uncomfortable situations is up to you, but your actions will have consequences and could make you some enemies along the way. Hunting has made a return, allowing you to track down a variety of creatures across the various regions and sell their scavenged remains for money. In the gameplay trailer, we got a look at some swamp-swelling alligators, bears, eagles, and wolves. But there’s one animal you want to keep on side - your trusty steed. As you progress your relationship with your horse increases, making them easier to control and less easy to scare. While you may wish to stick to one lucky companion, different horses specialise in specific purposes. We didn’t get much detail on weapons in this trailer. What we did learn is that guns will have unique characteristics and realistic reloading/recoil actions. Rockstar also teased the returning deadeye system, which we’ll hear more about in part two. We’ll get a look at more gameplay in the second part of the gameplay trailer, though Rockstar hasn’t revealed when we can expect it. Red Dead Redemption 2 will release on October 26, 2018 for PlayStation 4 and Xbox One.